Now we were all set to begin. Everything was set up in our backyard that was fenced in. I tried to see the cat and then put out the food and went to sit on my back porch. This cat was going to have to see me if she wanted to eat. I knew that I would have to be there to see how the cat would take to me, was she going to be friendly etc. Well she didn’t come into the backyard yet, but at the side of the house. So I began to feed her there and every day moved the dish further and further back to get it into the backyard so I could sit on the stoop and watch her. Check out these early pictures of her eating. I fed her once a day at the same time, before dusk about 6 p.m. I did not want to attract the raccoons, mice, rats, possums. This was the best time and I was home after work to do this. This was a routine and she knew to come around at that time. It was important to make sure she ate and then take the dishes back into the house. I watched her eat every day and sometimes my husband sat with me too. Half wet food and half dry food with water. She ate everything every day. It took about a week to get her to begin eating in the backyard. Now I could sit on the stoop and watch her. 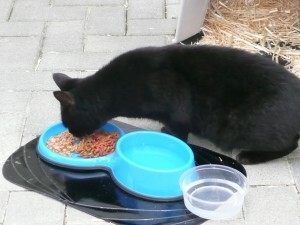 Sammie when we just met, feeding her. To continue my story, there was a black cat hanging around our house. It is possible I shooed the cat away. We saw this cat in 2012 through the winter. If my friend Mary can do it, so can I. So I thought, I could help out a cat and feed it outside. I thought I was allergic to cats since I had a bad allergic reaction to my sister in law’s house. So this would work out nicely. 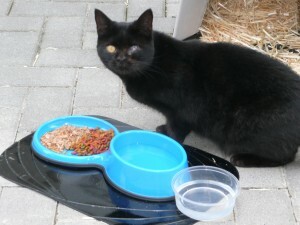 We noticed this black cat was small and hanging around our warm car in the winter and looked like it was blind in one eye. We are guessing female from her small size, so for now I will say her. My husband saw her with pizza in her mouth. Well that definitely endeared him to this cat. If this cat likes Italian food, then why not. Ha! So my husband was in too. I heard the town provided free neuter and spade program so I researched to find out what to do and spoke to them and went to the shelter. Check with your own towns or rescue places and see what they may offer. It is important if you can help out any feral or cats you see in a colony or who do not belong to anyone, to make sure they are trapped and neutered or spade. This way we can reduce and hope to eliminate homeless cats. I had to find a have a heart cage/trap and put in stinky cheap canned tuna to attract the cat to catch and then bring to the shelter. The challenge was I had to reserve a time and date. Gee wiz, I was freaking out. What if it did not work. So I had time since they were so booked up. I began to leave out food for this black cat. It was so exciting. I went to a pet store and had a new view on them, since I hardly ever went to them before. Other than turtles and fish, I never was responsible for a cat before. Wow! I picked up a plastic dual food dish that held both wet and dry food and another dish for water. We bought a shelter that would keep the cat warm in the winter. One of the igloo small ones. We bought straw for inside. We looked into blankets that could heat up in the winter and realized the best thing was to work out a heater for the winter later at that time. This was August 2012 when we decided to do all this. If you plan to feed cats in your yard, please take responsibility for caring for them. Some people think they are doing a cat a favor to feed them and not doing anything else. I feel really bad for a cat I saw who has an injury and I am feeling like trapping and taking to a vet. Also, cats do not live as long outside as inside. So if you plan to rescue, please consider in only. I hear of too many stories of people who say, my cat has to be outside for most of the day, they love it too much. In my view, it is nonsense. They get in fights with whatever animal, cat or raccoon. They go missing. Get hit by cars. I know all these stories from people I know. They are well meaning loving people who love their cats and animals. But, these poor animals have lost their lives or have shorter lives. Cats like the one I found are lucky when they are picked up. Unfortunately people dump these cats, for whatever reason, they are no longer cute and cuddly kittens, they are damaged, one eye, special needs cat as in the one I found. Once they are rescued, they all have unique personalities and love to give. Time and patience is key to transitioning them, but wow, what a reward for both the cat and person. They are learning so much more about animals today and their intelligence. It has blown my mind. I didn’t know that cats could have up to 100 sounds. I’ll begin at the beginning where it all started. My friend Margaret was rescuing cats outside her house that needed to be captured to make sure their population does not grow. She was doing what is called TNR – Trap Neuter and Release. She had about 5 cats that were friendly that she fed outside her house, but only after they had been fixed so they did not have any more babies. It is very important if you see cats outside your house to call your town to see if they have a program to make sure the cat population does not grow and have all these outside cats that could be loving cats inside someone’s home. Also, if you know of any cats in your neighborhood where people are feeding them but not having them fixed, can cause a huge colony of cats to develop. Since they are being fed and people think this is good they are healthy. Yet healthy enough to have babies and they can have a lot. Many kittens are still kittens having babies. Like a 10 year old child having babies for humans is my best comparison. Special Needs Animals and People Help Inspire and Promote Love. I am writing this story as it has been a life changing experience for me and my cat. Her name is Sammie. This is her story and mine. In telling my story, I hope you can save time that I took to learn what I needed to do, as well as inspire you to do the same or help orphaned cats and other animals when you can.